Replogle's dignified Kingston Desk Globe sits upon a walnut-stained hardwood base. The die-cast semi-meridian complements the traditional land mass colors and antique oceans. Raised relief provides a realistic perspective of our world. 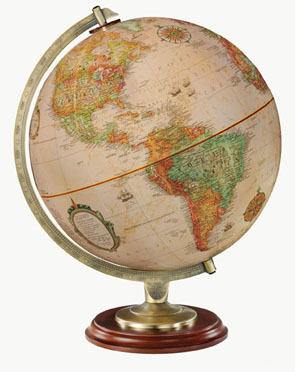 The Kingston Desk Globe is backed by a one-year warranty.